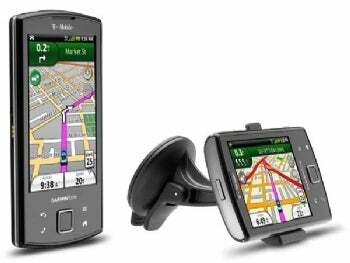 The T-Mobile Garminfone comes with a car mount and GPS navigation software. T-Mobile and GPS navigation device maker Garmin this week announced the Garminfone, an Android-powered smartphone with built-in Garmin GPS navigation software. The Garminfone will be available in June for $200 with a two-year contract. This is the first Android smartphone to have Garmin navigation software as an integrated feature. Users will be able to click on an address in an e-mail or text message and have the phone provide voice or on-screen turn-by-turn directions. The Garminfone responds to voice commands, a useful feature for drivers who use the included car mount/charger. The Garminfone will also include real-time traffic, weather, and local information, along with thousands of preprogrammed destinations such as the nearest gas station. An included app called Garmin Voice Studio will allow users to record custom voice directions. Other features include a 3-megapixel autofocus camera with digital zoom, a 3.5-inch capacitive touch display with auto day and night modes, stereo Bluetooth, a music player, MicroSD memory card expansion up to 32GB, Wi-Fi (802.11 b/g) short-range wireless networking, 3G cellular broadband data, and a quad-band GSM cellular radio. The radio means that the Garminfone should theoretically be usable worldwide, making it a practical travel companion. The Garminfone also has all of the other features one would expect of an Android 1.6 smartphone: access to the Android Market with downloadable apps, an e-mail client (with POP, IMAP, and Microsoft Exchange support), an HTML Web browser, and integrated Google voice search. Prospective buyers of the Garminfone should keep in mind that it runs version 1.6 of the Android operating system, whereas the most current version is 2.1. Android 2.1 offers a number of improvements over 1.6, and many new apps will not be functional on 1.6. T-Mobile has stated that the Garminfone is capable of receiving over-the-air (OTA) updates, but the company has not yet committed to providing an update at any specific time. Anyone who wants to be able to install the latest and greatest apps from the Android Market might think twice about purchasing the Garminfone. Another consideration: The latest version of the free Google Maps app for Android 2.1 includes many features found in the Garminfone software--most notably, voice command. You may find that an Android 2.1 smartphone with Google Maps fulfills both your navigational requirements and your need to have the latest Android Market apps. However, if downloading the newest apps doesn’t matter to you, the Garminfone with its car mount and voice-call capability may be a good alternative to a traditional GPS navigation device.